On Thursday 11 April, HS2 contractors Fusion, started removing hedgerows from a 300 acre site of countryside during bird nesting season, much to the outrage of local residents and animal welfare campaigners and environmentalists more generally. The campaign group Anti-HS2 – SOC (Save Our Countryside) were monitoring activity at the weekend when they came across the bird's nest. On Monday this week we were contacted and various attempts were made to seek expert opinion on whether the nest was indeed from this season. Some relevant context to this is that the photos were taken after the hedge had been cut down – presumably removing it from possible surrounding foliage. We also went on site to take a look for ourselves. Unfortunately the downed hedge and the nest had been removed by site workers, meaning we would be unable to obtain definitive expert opinion on the status of the nest. While in the vicinity we were approached by wildlife crime officer Dean Kingham. He told us that he had received a tip-off about the nest and had also seen a photograph that he thought showed an old nest, although when pressed he acknowledged that he is not an expert. Under the Wildlife and Countryside Act 1981 it is an offence to intentionally take, damage or destroy the nest of any wild bird while it is in use or being built. Ecologists need to demonstrate that they have checked vegetation and that it is clear of nesting activity before they can give a permit to clear. 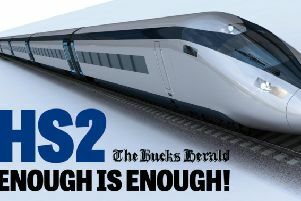 Considering that HS2's Notice to Proceed has been delayed until December 2019 because updated costs and a revised business case have yet to be submitted, there is growing concern that the North Buckinghamshire countryside may be being destroyed for no reason.